Danish manufacturer and art-collector; born in Copenhagen Feb. 7, 1836; son of Abraham Marcus Hirschsprung (1793-1871), who in 1826 founded one of the largest tobacco-factories in Denmark, of which Heinrich Hirschsprung is still (1903) the proprietor. Hirschsprung's great collection of paintings, pastels, water-colors, etc., was exhibited in Copenhagen in 1888. He is the founder of a legacy for Danish artists (Hirschsprung og Hustru's Kunstnerlegat). Hirschsprung's brother, Harald Hirschsprung (born in Copenhagen Dec. 14, 1830), graduated as M.D. from the University of Copenhagen in 1861. 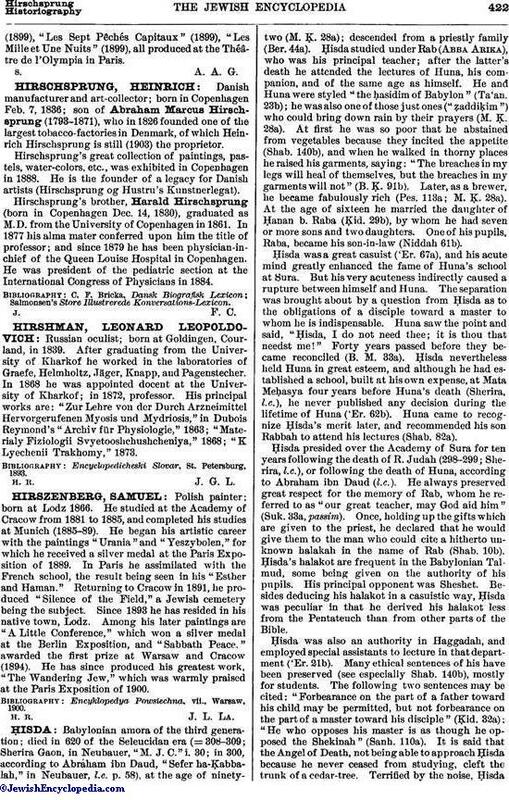 In 1877 his alma mater conferred upon him the title of professor; and since 1879 he has been physician-in-chief of the Queen Louise Hospital in Copenhagen. He was president of the pediatric section at the International Congress of Physicians in 1884.